Summary: Paul is going to show in this passage and in the first part of Chapter 4 some of the benefits that come to us by trusting Christ that we could never receive under Law. Paul is going to show in this passage and in the first part of Chapter 4 some of the benefits that come to us by trusting Christ that we could never receive under Law. The Law could never give a believer the nature of a son of God. Christ can do that. Only faith in Christ can make us sons of God. With the arrival of Jesus Christ, the nation of Israel moved out of childhood and into adulthood. The long period of preparation was over. While there was a certain amount of glory to the Law, there was a greater glory in the gracious salvation of God as found in Christ. The Law could reveal, and to a certain extent it could control behavior, but the Law could not do for the sinner what Jesus Christ can do. To begin with, the Law could never justify the guilty sinner. “I will NOT justify the wicked,” said the Lord (Ex. 23.7); yet Paul says that God “justifies the ungodly” (Rom. 4.5). 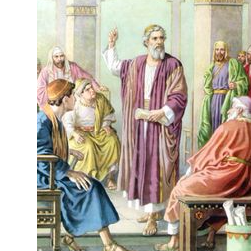 King Solomon, at the dedication of the temple, reminded God to condemn the wicked and justify the righteous (1 Kings 8.32); and this was a proper request in light of the holiness of God. The trouble is that nobody was righteous! It is only through faith in Jesus Christ that the sinner is justified—declared righteous—before God. Furthermore, the Law could never give a person oneness with God; it separated man from God. We find this kind of separation associated with the tabernacle where there was a fence around the tabernacle and a veil between the holy place and the holy of holies. The Law functioned as a method, suggestion, help or guide toward an understanding of moral principles; it was never intended to save anyone. The moral law summed up in the Ten Commandments, is not primarily a set of rules for conduct; in it are eternal principles that are forever true and valid. They are like spokes in a wheel in which Christ is the hub. The Law could not impart life, but it could lead men to Christ in whom is “abundant life.” In that way the Law was not the enemy but the minister and servant of grace. While God is the father of all people in a general sense because He created them, only faith in Christ can make us His children, the legitimate “sons of God.” I use the word legitimate for emphasis, because the only sons God has are legitimate sons. You are made a true son of God by faith in Christ, and that is all it takes. Not faith plus something equals salvation, but faith plus nothing makes you a son of God. Nothing else can make you a son of God. “For you are all sons of God.” How? “Through faith in Christ Jesus.” On the other hand, unbelievers are the children of Satan—“Then Saul, (who also is called Paul,) filled with the Holy Ghost, set his eyes on him, And said, O full of all subtilty and all mischief, THOU CHILD OF THE DEVIL, thou enemy of all righteousness, wilt thou not cease to pervert the right ways of the Lord?” (John 13.9, 10). An individual Israelite under the Law in the Old Testament was never a son, only a servant. God called the nation “Israel my son” (see Ex. 4.22), but the individual in that corporate nation was never called a son. He was called a servant of Jehovah. For example, Moses was on very intimate terms with God; yet God said of him, “Moses My SERVANT is dead” (Jos. 1.2). That was his epitaph. Also, although David was a man after God’s own heart, God calls him, “David my SERVANT” (see 1 Kings 11.38). My friend, even if you kept the Law, which you could not do, your righteousness would still be inferior to the righteousness of God. Sonship requires His righteousness, you see, the New Testament definitely tells us, “But as many as received Him, to them He gave the right to become CHILDREN OF GOD, to those who believe in His name” (John 1.12). We are given the power (Greek, exousian, meaning, “the authority, the right”) to become the sons of God by doing no more and no less than simply trusting Him. A Pharisee by the name of Nicodemus, religious to his fingertips (he had a God given religion, although it had gone to seed), followed the Law meticulously, yet he was NOT a son of God. Jesus said to him, “Do not marvel that I said to you, 'You must be born again'” (John 3.7). I want to be dogmatic and very clear—neither your prayers, or your fundamental separation, your gifts, nor your baptism will ever make you a son of God. Only faith in Christ can make you a son of God. Paul is going to show in this passage and in the first part of Chapter 4 some of the benefits that come to us by trusting Christ that we could never receive under Law.